Yesterday’s brain teasers offer a mix of winter interest trees to help you plan your garden for next year’s snow cover. Structure, bark texture and bird habitat make it more spring-like in what, otherwise, is a stark landscape. Another one of the teasers offers a possible winter hobby for gardeners - bonsai. 1) All bonsai plants, whether temperate or tropical should be kept outdoors during good weather. True. Both temperate and tropical bonsai should be kept outside and brought in when the appropriate temperatures are applicable. Tropical bonsai cannot be exposed to freezing temperatures and can grow indoors year-round with proper sunlight. However, the tropical bonsai will thrive if brought outside during the warm season weather, preferably May through September. The temperate bonsai is the most difficult to grow because of its requirements for a cold dormant period. If you keep a temperate bonsai inside all year-round providing an endless summer, the plant will automatically go dormant after a couple of years, causing stress and ultimately killing the plant. How would your body respond if you didn’t sleep for two years? 2) Spruce Trees tend to be deer-resistant. True. 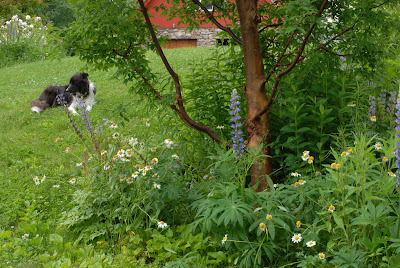 For those readers who have asked for deer-resistant plant materials, please find this .pdf Cornell University link to help you choose some options when planning for your spring garden. (http://www.gardening.cornell.edu/factsheets/deerdef/bridgen_list.pdf) There is also a book on the market called "Deer-Resistant Landscaping; Proven Advice and Strategies for Outwitting Deer and 20 Other Pesky Mammals," by Neil Soderstrom (Rodale Inc., $23.95). Unfortunately, if deer are desperate enough, these cute but pesky creatures have been known to munch things on the ‘Do no eat’ list. 3) Acer griseum is a pest found in most maple trees. False. Acer griseum, Paperbark Maple is one of Annie’s favorite maple trees. Its beautiful cinnamon-colored bark provides spectacular winter interest in your garden. This maple’s slow-growing habit makes it an exceptional specimen tree. It is also used as bonsai. 4) Betula nigra, River Birch has low resistance to the birch borer. False. River Birch has a high resistance to birch borer, a nasty pest that hits many other types of Birch, primarily White-barked Birches (i.e., Paper, Himalayan and Asian White Birch). River Birch has beautiful peach-colored exfoliating bark and form. This is another one of Annie’s favorites for winter interest trees, especially the Heritage variety, which has the most vibrant color. 5) Holly shrubs provide great winter nesting areas for birds. True. These evergreen shrubs provide winter protection as well as valuable food for birds. But remember, not all hollies are evergreen. If you check back to Tuesdays with Annie 10 27 09 http://bilowzassociates.blogspot.com/2009/10/tuesdays-with-annie-10-27-09.html, there is one holly that is deciduous! Do you remember without peeking? The inspirational thought for the day is by Ward Elliot Hour. “The color of springtime is in the flowers, the color of winter is in the imagination.” As I pointed out yesterday, use your winter dormancy period to broaden your perspective. Great tips! Your blog is amazing, and cant wait to see what content you have in store for the future.